T.I.N Magazine is personally sharing this news with our dear readers. Yes! it looks like another feat has been attained in the education sector this year.. Note: This news is yet to be confirmed by T.I.N Magazine, it is just a report. According to Instablog, a student from Kogi state has set a new JAMB UTME record score in the history of Nigerian examination. The young man named Ibrahim Shamwifu reportedly got an almost perfect score of 399 out of 400. 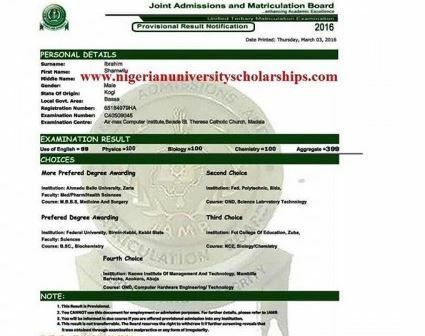 The result was shared online by Nigerian University Scholarships, and it is said that Ibrahim will like to study Medicine and Surgery at the Ahmadu Bello University, Zaria, Kaduna State. Last month, Unilag produced a student with a 5.0 CGPA for the first time in history in the person of Daniel Dada Ayodele. The young man was awarded with 1 million naira at his convocation and has also gotten various offers from top multinationals including telecoms giant, MTN. Well, T.I.N Magazine may soon be documenting his record in the T.I.N Nigeria super records after we make total confirmations of this report, as he is gonna be getting a record certificate from us soon.